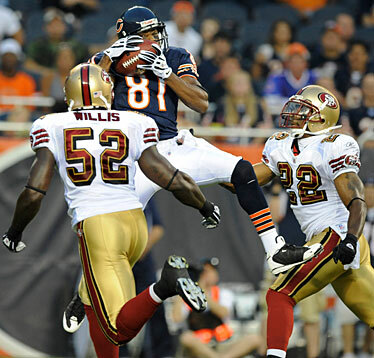 Bears receiver Rashied Davis caught a touchdown pass from Kyle Orton yesterday between 49ers linebacker Patrick Willis and cornerback Nate Clements. Orton and Davis connected for scores twice, but San Francisco won the game 37-30. Hawaii alums Jeff Ulbrich and Isaac Sopoaga of the 49ers and Leonard Peters of the Bears each had a tackle, while former UH receivers Ashley Lelie (49ers) and Ryan Grice-Mullins (Bears) did not play. Tickets are now available for the inaugural Kapalua LPGA Classic, scheduled for Oct. 13-19 at the Maui resort's Bay Course. Season-pass tickets are priced at $35 and include access to the 72-hole tournament, Oct. 16-19, practice rounds and the pro-am Oct. 15. Good-any-day tickets run $10 a day. Children 16 and under will be admitted free when accompanied by a ticket-holding adult. Free pro-am and two-day practice-round tickets are also available. Call (877) 772-5425 or go to kapalua.com. Brandon Webb pitched seven shutout innings for his career-high and major league-leading 19th victory last night in the Arizona Diamondbacks' 4-1 win over the San Diego Padres. It was the sixth straight winning start for Webb (19-4), giving him eight wins in his last 11 starts. He allowed three hits with eight strikeouts, both tying season bests, as the Diamondbacks completed a three-game sweep. Arizona won for the eighth time in the last 10 games and maintained a two-game lead over Los Angeles in the NL West. The Diamondbacks improved to 34-16 against division opponents. Meanwhile, American League wins leader Cliff Lee of the Indians earned his 18th victory as host Cleveland beat the Kansas City Royals 10-3. Lee (18-2) allowed three runs - two earned - and six hits in seven innings. The left-hander struck out seven and induced four double plays. Lee also leads the AL in winning percentage (.900) and ERA (2.43). NEW YORK » The Williams sisters could meet in the quarterfinals of the U.S. Open. The Open held its draw ceremony yesterday. Struggling four-time defending champion Roger Federer could face No. 3 Novak Djokovic in the semifinals. New No. 1 Rafael Nadal has several players who have been playing well lately in his half of the draw. He could meet American James Blake in the quarters. Top seed Ana Ivanovic could face No. 6 Dinara Safina in the women's quarters. Safina won a silver medal at the Olympics. The Williams sisters, each a two-time U.S. Open champ, won doubles gold together in Beijing. They played in the final of the last Grand Slam at Wimbledon. Also yesterday, Sania Mirza pulled out of the U.S. Open due to an ongoing wrist injury that flared at the Olympic Games. The Indian 21-year-old said that she would be unable to take part in the final Grand Slam event of the year, beginning Monday.